Badges can be the bane of a Guider’s existence, can’t they? Although they provide satisfaction and joy, they are small and easily lost. They like to hide in every nook and cranny of our Guide bags, and only show up in abundance after you’ve purchased more, because you thought that you ran out of that First Aid badge. When I was a Guide, many moons ago, my Guide leaders (one of which is still at that Unit, bless your heart, Mrs. Matson), used a fishing tackle box (maybe a tool box? My memory is a little foggy). But I remember looking upon that box on badge night with awe. It held all that I wanted, those little colourfully designed bits of fabric that said “Yes, you are indeed an endangered species specialist.” Becoming a Brownie leader 10 years ago posed a problem. I had no interest in lugging around a big ol’ box of badges. You see, when I was a Guide, we had badge night. At the end of the night, we would be given our badges right away, which was very exciting. However, this method required having enough badges to satisfy demand, and have at least a couple of each (at the time, probably close to 40). Also, I found that as a Guide, I would forget that it was badge night, and so I would often miss my once a month opportunity. When I became a Brownie leader, the Guiders that we took over from had allowed the girls to bring an item for show and tell. Over the years the girls started bringing in more things, and it started to eat into our meeting time. So, we phased that out and told the girls that they could present up to two badges at the beginning of the meeting. This allows the other girls to see what each other is doing, and gives them an opportunity almost every week to earn a badge or two. This tends to take about 10 minutes. If we have many girls who have worked on a badge, then we split the group in two. Like my sisters in Guiding, I started off by giving the girls their earned badges each meeting. However, badges started getting lost, and my supply quickly dwindled; I had to remember who had received their badge, and which ones I needed to order more of. So, we switched gears. We started handing out badges three or four times a year. That way each girl would receive something (we tend to do a few badges during our meetings as well), and I didn’t have to worry whether they had already received it or not. We use the Brownie Record Keeper that we found in the Member Zone (the original handbook doesn’t include the Cookies Rising badges, and left out a Special Interest one, too). When we give the girls their badges, we highlight it, so we know they’ve been received. And this is how we store them: in a binder, using baseball card sleeves. I write on each pocket what the badge is, in order of the program book, and keep them in there. It’s great to be able to see what you have at a glance. Liz Voce. Photo credit: Takeshi Ochiai. 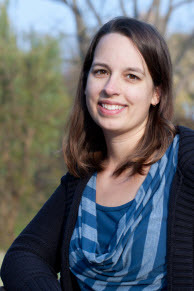 By guest blogger Liz Voce. Liz is a Professional Organizer in the Toronto area. She stays busy (but very organized) running her company Sort It. Read her previous posts on our GirlGuidesCANblog: Community Counts – And So Do You!, The Crafty Cluttered Guider, Guiding Someone Through ‘Collecting’ Versus ‘Hoarding’, Thrills, Spills and Chills. This entry was posted in Girls' Guides and tagged badges, brownies, organized. Bookmark the permalink. If it’s the same Mrs Matson as my daughter had the past three years, she is awesome! As a surprise when C. earned her Olave B-P award and advanced to Pathfinders, Mrs. Matson hand knitted a little Girl Guide doll with C.’s hair and eye colour, and made up a memory book with photos from all three years of her time in Guides; enrolment, hikes, Halloween parties, fun events. What an amazing gift!!! If she’s in Toronto, I’m betting it’s the same one 🙂 She is pretty amazing! I use an embroidery storage box for my Brownie badges. We do badge testing probably 6 times a year, and order badges usually the night I get home from badge testing. We choose meetings for badge testing that are sort of “relaxed”, that girls done mind deeking out of the main activity to go sit at a table with a leader for 3 minutes. We’ve got some big badge earners, so to not limit them, they can COMPLETE as many as they want, but we only let them show a leader 3 badges.. I “take the rest home and make sure they’re up to snuff” AKA I write down the names of the badges. If the badges are especially cool or “show” worthy, or a girl is dying to show the other Brownies, then we sometimes do that at the end of the night. We’ve had girls show off their electricity circuit kit, a working trebuchet, dancing, and musical instruments. Darn talented and smart young ladies! Another tip regarding badges I send to parents.. to encourage girls to dive further into Brownies.. is to email / send home a few “badge sheets” before the winter holidays or March break (times they will complain of boredom!). It’s clearly stated that it’s not homework, it’s just an easy way to earn some extra badges if they wish! Badge sheets are pretty much just the badge criteria typed out with cool fonts and a clip art image or two. Sometimes badges say “play a game that includes..”, so I would FIND the game/craft/etc for them, so it’s even easier to complete. Remember there are no badge police everyone. 🙂 Be flexible and remember that it’s all about effort, learning, and boosting self-esteem. LOVE your idea of badge sheets! would you be willing to share any? great idea! i really should sort mine out…it’s a bit of a mess. We badge test in a show and tell method…same as yours it seems. It’s great and a great way to encourage the other girls to work on some. I’ve been storing my own (the HUNDREDS) that need to be sewn onto a camp blanket in a photo album, but adding in some collector card sheets would be great for the smaller ones. I, too, have a camp blanket, and about 25 badges that need to go on… You know, if we both committed to sewing one or two a night while we’re watching TV, we’d get through our stack. What do you say? This is a great idea! I’m a Guides guider in the Yukon, we have an office (not many left though) where we can get the badges from. I usually just go to the office the next day and get the badges for the girls for the next meeting. When we present, I make a certificate for each girl, listing all her badges on it and staple the badge to the certificate so that they don’t go missing between me handing them over and getting onto the sash! I also send home a Badge Evaluation form, which is very simple, asking which parts of the badge the girl has completed and if there is anything they need to improve on… this is really handy when someone outside of Guides tests them (ie. their teacher or coach etc.). Thanks for sharing! How large is your unit up there? LOL. Yes, those key badges are similar. I have a couple that actually had the key written out on it (i.e. “Key to Brownies”), but I guess the picture of a key was preferred. I heard the keys with words had to be changed to just a key because they weren’t bilingual… sometimes the colours are a bit tricky to distinguish. I use an embroidery box as well, though I suppose it could double as a tackle box. I usually have 1-2 of the popular badges on hand (pet keeper, sport, reader, etc) and then any badges I know we’re going to cover over the year. I also keep a supply of the program badges for Guides. These are going to be earned year in and year out, so we usually have enough for all the girls in the unit. For badges the girls earn that we don’t keep on hand, we place an order once every two months and like Liz, we highlight the program records with what the girls have received. I date every badge they earn and then highlight to know they’ve received it. So far, this method has worked well for us. Thanks Stephanie 🙂 Glad I’m not the only one! Yep, I do the same… a few on hand of the popular ones plus whatever we are working on. Kept in a small bead box (12 compartments). I write on the badge sheets the date when the girl earns the badge, then highlight it yellow when I hand them out. That way I can see quickly what I might still owe to a girl from badge sharing when I place my next order. I really liked your idea. I think this deserves a larger audience. Therefore, I am sharing your post on my social profiles. I hope this will help in some way. 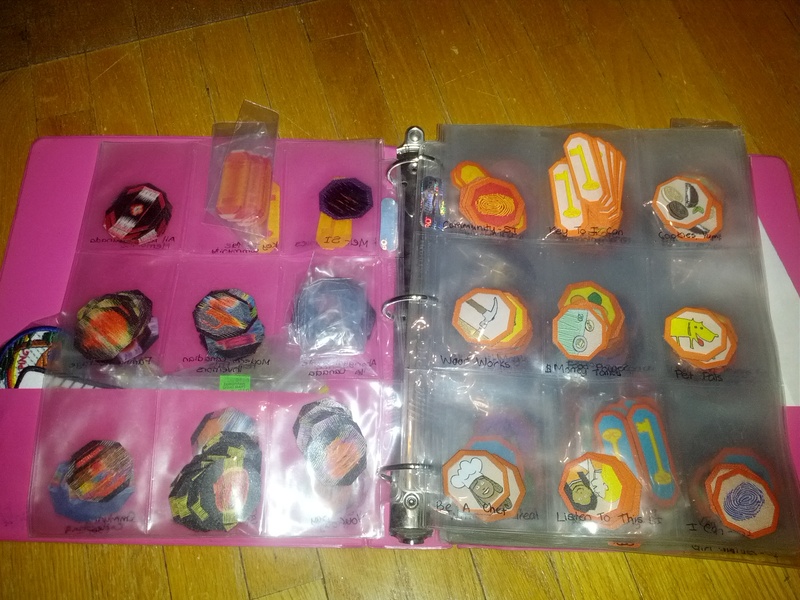 I love this idea for storing badges and just bought some binder inserts like these. However, I put the badges in and they keep slipping out:( Do you have this problem? Any ideas to keep them in their pockets?